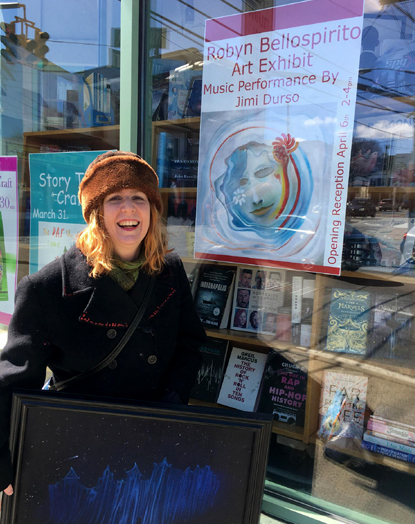 This month, April, my art is on display at The Dolphin Bookshop and Cafe in Port Washington, NY. There is a lot of new work in the show, including recently completed oil paintings, smaller watercolor works, and mandalas. Last summer when I had my art at The Dolphin, it felt like a very different show. Back then I included “Primavera, Baby!”, my colorful Spring Goddess with a flower crown and sunglasses. The current show has work that has more blues in it, although not all. I’ve framed my smaller watercolors, some that are blue and starry, and also the mandalas. There is a lot of work that I would love to show but no longer have access to, either because it has sold, or is being stored and is not available to me. So, I looked deeply into my closet and stacks of art to find work that hadn’t been seen that I might be able to include. There are a couple that I found that are older, in excellent condition, that had never been seen by anyone but me. Then there is work that was wet on the canvas two days before it was hung on the wall. At this point in my career, I think of almost every solo exhibition as a retrospective of sorts. Of course it would be a dream to have a big studio space with lots of light where I could work as large as I liked, do completely new art for each show and have a place to keep the ones that don’t sell when the show is over. Isn’t this what every artist dreams? Ah… well, it’s my dream. One day, perhaps I will have that space. So much wants to be born from me… colors, images, shapes, and that blending thing I do when my brush has been loaded with different colors and some of each color remains trapped in the brush in layers until I press it onto the surface of a canvas. Then I blend, blend, blend and things come out… shadows and colors that have no name. I make it smooth, too. That’s just always been what I have preferred. It would be wonderful to be creating new art regularly, but that is not an option partially because of lack of space. So I show work from all periods of my life, and each exhibition is a glimpse of many years of my devotion to my art. Hanging shows was always easy for me until recently, because of my health. I’ll get through this, my doctor says (and I believe him), but I knew I needed help and put the call out. My long-time friend and fellow artist Mike Stanko offered to help and was a HUGE help!!! I would have had great difficulty on my own and would have probably been there all day figuring out how to manage. A HUGE THANK YOU to my friend Mike! Whenever I hang a show I bring more work than I need. I think this is probably the case with most artists. We can make a rough estimate as to how many paintings will fit in a space, but how they look side-by-side and how cohesive it is, is another thing. One of the paintings I hoped to show was the one I’m holding in this photo. It’s called “Night City”, and it’s a very deep, luscious dark blue painting with a floating city in a starry sky. This painting inspired me to write a children’s story years ago. I won’t give the story away, but basically it’s about having a safe place, wherever you are, where you can be who you are, have peace and quiet or run in the halls like a sillyhead, where no-one will tell you that you’re wrong for being who you are. It’s a good story, I think, and one that would be helpful for kids to read. Unfortunately, I didn’t include this painting in the show because it just didn’t work somehow with the rest of them. Years ago, I included it in another solo exhibition and a little girl of about ten years of age came up to me and said it was her favorite. That touched my heart, especially because of her age, and I wasn’t aware that anyone had actually seen it. She really saw it. I’m looking forward to my opening tomorrow. Jimi will play some of his beautifully atmospheric music and I may join him on my bass on a few songs. I look forward to seeing friends who are able to attend, and perhaps meeting new people who come. So far 2019 has presented me with some intriguing art experiences that have brought me new inspiration. The form of a circle, the never-ending path of the spiral, and the labyrinthine inward turning of the mandala are in me and my art. I do a lot of art now. I paint small circles with watercolors and add pen and pencil to them to create enclosed little worlds. Using colored pencils, I draw mandalas which do not look like the mandalas most people are familiar with, but I anchor the design on the central point even if it is not immediately noticeable. I’ve always liked the ‘tween times and ‘tween spaces, a dancing around of sorts. In January I went to visit the Guggenheim to see the art of Hilma af Klint, which deeply resonated with me in a million ways, most of which I wouldn’t be able to explain in words. Around that time I worked with a fellow shamanic practitioner who invited me to draw a mandala. Before the new year, I had already been creating small watercolor circles. I remembered Carl Jung’s Red Book. All of it came together. I continue to create mandalas as a way to find peace. I turn to the circle for solace and self-understanding. Oftentimes these days, my art feels like a self-prescribed balm for health issues I face, as I am being treated for chronic Lyme and also require more eye surgery in coming months. In Lyme, there are spirochetes which are spiral organisms that invade the deepest crevices of the joints and organs and are hard to eradicate from the body. Perhaps through the spiral and circular forms I create, I can find a way to the corkscrew-shaped life forms, and a way to make peace with them somehow. There has been a saying that to catch a fish, think like a fish. I’m not sure if this will work for me, but at least drawing the circles and mandalas brings me great peace while I’m doing them. Creating them calms my mind when my thoughts begin to race with fears of how I will get through this, how I will regain strength, how I will get rid of the excruciating overall pain in my body, and how my health will be restored. The whys are clear… nymph deer tick bites all over me in September, 2016. I pulled almost twenty fully engorged ticks off of me and had over fifty bites all over. They were small and stayed on despite showering. It took me more than 48 hours to discover them all. I became severely ill within days - difficulty walking, thinking, seeing, intense light sensitivity, a racing heart, slower breathing, the development of a facial tremor. One friend who was a nurse saved my life because she was the only one paying attention, calling me frequently to check on my symptoms and suggesting I get on a course of doxycycline asap. I did a 21-day course which got rid of the symptoms, but two months later symptoms returned and worsened and more symptoms appeared. The why’s are clear, but the how’s are not. After going to several doctors for help over the last 2-1/2 years, I am currently seeing a Lyme specialist and I have some hope as I continue forward. So I sit with spirals, in the great labyrinth of life walking to and fro toward one destination. And I draw. A compass creates the circle around a central point. The pencils smoothly glide across the paper and the harder I press, the more vivid the colors. With a steady hand and two sets of eyeglasses with still no clear focus, I find my way around. In July, 2018 I had a solo show at The Dolphin Bookshop and Cafe in Port Washington, NY. It's a really nice space in a charmingly unique little bookshop in a cool seaside town. I was happy to show my art there. During the Opening Reception on July 7th, 2018, friends came to see my work and musician Jimi Durso played some cosmically ethereal music on his electric guitar. The photo below was taken by my dear friend Liz when I was moved by the music to begin a slow dance. That was one thing I didn't plan to do, but when the music moves us, its important to follow where it leads. That was a really special afternoon. I did not make the dolls in the photo above, but they are similar to what I made for a friend. Several years ago I began making small dolls for friends out of homemade clay, fabric and other materials. I called the dolls "I Love Me" dolls, and each one was a small version of the person for whom it was created, with colors and objects that held meaning for that particular person. My intention was to make dolls for my friends that would help them get in touch with their little self, their child self, to help them feel nurtured and feel self-love. It's strange being an artist who has all my life, known myself to create art as, well... art. For most of my life, even though I knew my art had a spiritual component to it, I didn't do it with any spiritual intention, but merely to create art as an artist does. Recent years of progressing on my spiritual path have allowed me to see my art differently. A teacher called my paintings power objects and I thought, hmmm... that's interesting. The papier mache masks I made were created for pure fun, although since I made them years ago, I learned about the use of masks in sacred ceremonies, particularly in shamanism. Some of the art objects I've made (as art), are still art to me but yet call to a deeper place within me, as if they were made for a purpose greater than what I had intended. One example is my "buddies", as I call them, or skulls on sticks. They were made for a performance, but feel like they have a deeper meaning the more I have them around, although I only use them in performances and creative projects. I'll write about them in a separate blog entry of their own at some point. More and more I am seeing that so much of my art is linked to my spirituality, and that my artistic talents can be used to create power objects for others and for myself. Recently a friend for whom I had made an "I Love Me" doll a few years ago contacted me to request that I make her a new doll. She is a dear friend who is going through treatments for cancer, and she wrote asking for a doll that would help her find strength and love. This is something special, not just an "I Love Me" doll. I needed to journey on this one, so I did. In a journey I met with this friend's great-grandmother who told me exactly what the doll should look like and what it should be made of. It was to look much like a Native American corn husk doll, but made instead with cotton cloth and other soft materials. According to her great-grandmother, it was very important that the doll wear the color red, for strength. I worked in sacred space, smudged the materials before using them, and then began to work with love in my heart and my hands. The doll ended up being a little bigger than the one shown to me in a journey, so I checked again in another journey to ask if it was right, and the great-grandmother said yes, it was. I didn't take any photos of it. The dolls in the photo above are just examples of what I based this doll on. It was different, but similar. It was difficult scheduling a time to deliver this doll to my friend, as her schedule is filled with doctor's appointments, self care and time with her family. One day I knew it was time for the doll to go to her. I think her great-grandmother was prodding me a bit to get it to her somehow. I happened to have a wooden basket with a lid, so I set the doll inside of it on some soft fabric with a card explaining its creation, wrapped it with ribbons, and then left the basket on my friend's doorstep. She let me know it was received, which is all I wanted to know. It's so important in this work to not have expectations or be attached to an outcome, just to do the work and let it go. With my paintings and other art that is "just art" (is it ever really JUST art, I wonder? ), I sign them. But, when a special object is made for someone else, it wouldn't be right for me to put my name on it. It's not mine. I'm just the conduit making it for someone else, guided by spirit. Peace, Healing and Blessings to all. "Building the Temple", oil on canvas. For a period of about a year, beginning in 2007, I painted in an abstract style. I made a video of those paintings and have posted it here on my website under the "Art" tab for those who wish to know the story of them. One of these paintings was titled "Building the Temple". Some of my abstract paintings were a bit more visually chaotic than others, and all of them felt very free to create. The freedom was scary at first. Freedom sounds like it would be a good thing, and it is. But when we are used to some degree of control, making a shift toward letting go and allowing things to be a lot more loose and free-formed can feel a bit daunting. After that fear passed, I found the process of creating these works invigorating. "Building the Temple" emerged with this same freedom, but with a sense of deliberation, as if the building blocks already knew exactly where they were supposed to be and just fell into place with each brush stroke. The energy was settled and serene. It told the story of creating wholeness. I remember it vividly. I created this after I had had a healing session with the shamanic practitioner I was working with at the time and I was feeling as if pieces of me had been put back into the right place. They had been, and this was the result. When she saw this painting, she felt drawn to it and pretty instantly felt its peace. I knew it belonged with her and gifted it to her as a gesture of my gratitude, for it was a symbol of our deep work. "Hibernation: Dreamtime in the Cave" (left), and "Dreamtime in the Garden" (right). Last January I developed pneumonia and it took me months to recover. Right now it is late summer and still strength and energy are returning, and many days for me are quiet, easy and slow. I am honoring what my body requires. I am also honoring what my spirit requires, as what I experienced while recovering from pneumonia was powerfully spiritual. When I was sick I was taken away from the world, when previously I had been extremely active in it. I had to let go. Many days in bed with little or no energy forced me into a state of being, rather than doing. There were no days or nights as the concept of time fizzled away and it all began to blur together. It felt like I was dying. I fought it at first, but at some point I had to let go.... let go of all that I wanted to be doing, all the plans I had made, let go of what my life had been before, and maybe even life itself. There were things I experienced while in this state of being that were profound. Things inside, as well as out. I was curled up within a metaphorical cocoon and felt surrounded by the love of the universe, by the love of my Spirit Helpers, supported, wrapped, and held. It's difficult to describe any other way without going into too much detail, but it was a deeply sacred experience. I was being supported through the process, loved and cared for in a way that requires pure faith and complete abandon to be fully aware of it, and to realize what an incredible blessing I had been given. Desire to do anything left me, even when I began to very slowly recover some physical strength. It was as if everything I was or thought I should be had been erased, cleared away, cleansed. It was an opportunity to start new. I listened for stirrings within as to what I wanted to do, even things that required little energy. Nothing called to me until a friend told me about a juried art exhibition for self portraits. At a time when I was no longer sure of who I was, I wondered what kind of self portrait would emerge. In my bed, I painted. Even that exhausted me, so neither of the paintings I did are completely finished. That is okay. "Hibernation: Dreamtime in the Cave" came first, and then "Dreamtime in the Garden" followed. I entered them both into the show and the garden one got in. When I looked back in my journal I saw I had written that I had had a dream about a Bear Dance, to honor the Spirit of Bear, just before I got sick. Around me at that time, before getting sick, I also saw words or images of Bear in different forms and places. Bear was with me in the cave as I hibernated too. It was all so sacred. The only other thing I felt like doing was reading and delving more deeply into my spiritual path, the one I was called to. So I did, voraciously. I've read about other people's periods of initiation and although everyone goes through something totally different, one thing is common: there is a letting go, a being taken away from life for a while that occurs and afterward, we are not the same. Things we thought we were have been cleared away and paths we were headed down may no longer feel right. What we are left with is what is true for us, whatever we discover that to be. In one way that time was brutal, but in another it was really quite beautiful. Paint, Dance, Pray: Who Am I and What Do I Do? One thing I know for sure is that I am an artist. I've been painting since I was about eight years old and it quickly turned into something that I needed to do. I still need to do it. Even if periods of time go by when I do not paint, I know that I am still an artist. Rilke's "Letters to a Young Poet" come to mind, along with an old friend's encouraging words years ago that reminded me that even during times when I'm not actively creating works of art, that I am still and always will be an artist. If I could say I am just a painter that would feel simpler, but I am pulled in different directions toward ways of expressing myself that feel right and interesting and good to do. Those things, along with my spiritual life, which is a way of life for me, make life feel very full because there is always something to work on, to be curious about, to explore, to learn, to expand into. I paint and once I finish one, another is ready to quickly emerge, but there isn't always time to let it. My spiritual life is ongoing, daily and enriches my life more than I can say. I'm on a path and there is still so much to learn, but I'm on it, doing it. Those two things alone make for a very rich life, but there is more... I make masks and costumes, mostly for performances but now also for spiritual work. This year it seems I am meant to take the year off from performing, but the desire is always there in the background... the stories come through my dance whenever I start to move a bit, and that is a spiritual experience in itself. Then there are other things like painting shoes and drums and things. Those, alone could be a full-time endeavor. Perhaps I should just call myself "Little Miss Gemini-Rising", and embrace it all. Actually, this is what I do, although it is a juggling act and it can be a bit challenging to maintain the balance between it all. Some things take precedence, of course. Spiritual work is at the top of the list, right next to art making. Sometimes they tie in together nicely. It all intertwines for me. That's it for now.... life is an interesting ride, isn't it?